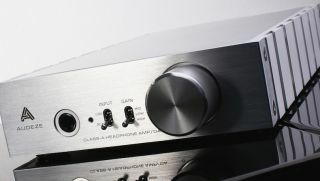 Audeze Deckard headphone amp and DAC lands in the UK for £599 | What Hi-Fi? Named after Harrison Ford's lead character in Blade Runner, and with casework created by BMW Designworks, the Audeze Deckard has an interesting pedigree. We first saw the Deckard at CES in January, and it was slated for a UK launch in spring 2015. Well, what's a few months between friends? Inside it has Class A amplification and high-performance DAC (digital-to-analogue converter) capable of handling audio up to 32-bit/384kHz. Gain and input can be adjusted using the front-panel switches, so you can also use the Deckard as a line-level preamp. You also get optical digital and analogue RCA inputs. Although designed to work in harmony with Audeze's EL-8 headphones, the unit is compatible with a wide range of headphones from other manufacturers. The Audeze Deckard is available now for £599 from leading hi-fi retailers including Richer Sounds.